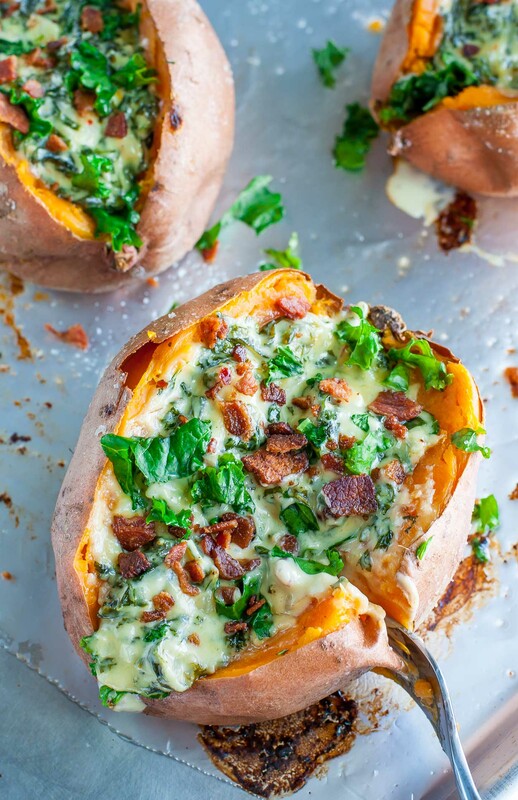 These savory stuffed sweet potatoes are my go-to single gal dinner. Here’s a run down on how to make these tasty stuffed spuds with some of my favorite combos! True Life: I used to hate sweet potatoes. Not just hate…. but loathe. I basically would rather have eaten sand than a sweet potato. I even gave them first billing on the EW List I compiled when I first started blogging. These days, however, we’re pretty hot and heavy. “If you’re going to take that up to your room you better leave the door OPEN!“ kind of hot and heavy. I should expect a nice orange glow of a tan any day now b/c of the sheer volume of these things I put away each week. If you told me a year ago I would be this head over heels I would have laughed in your face. If you told me this 6 months ago… I would have insisted I only like them in french fry form. Yet now… now I’ll fight you for the last sweet potato in the grocery store. Life is funny like that. So did I have a point with all this? Yes! Make these! After tweeting/instagramming about a zillion of these babies, I decided they needed another post to call their own. They’re kind of a big deal in my kitchen these days. Especially this one. So… do you want to get in on the action? (say yes!) Here are some of my favorite add-ons to get you started! If you get a chance to whip up one of your own savory stuffed sweet potatoes, let me know! Leave some love in the comment form below or tag your photos with @peasandcrayons on Instagram so I can happy dance over your creation. It looks like you’ve got all my favourite things on top of that sweet potato! Thanks Maranda! I could totally go for one of your twice baked broccoli potatoes now! YUM! 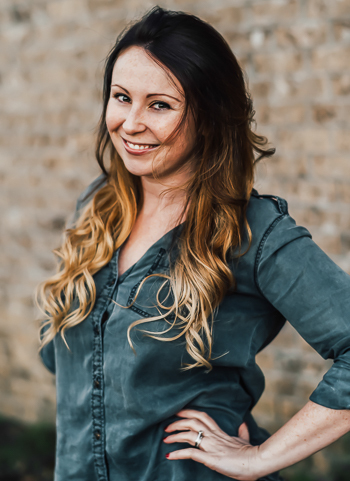 I am new to your blog and loving every sentence! I just had to share that I too was a long time hater of the dreaded sweet potato. I believe this was because they were always served in the style of their namesake – SWEET! Now however, I know the wonders of the savory sweet potato. My favorite is to make a twice baked broccoli & cheese stuffed sweet potato with Greek yogurt and salt & pepper. I will also make it with anything mexican. Thanks for your ideas! Yum – that looks delicious! 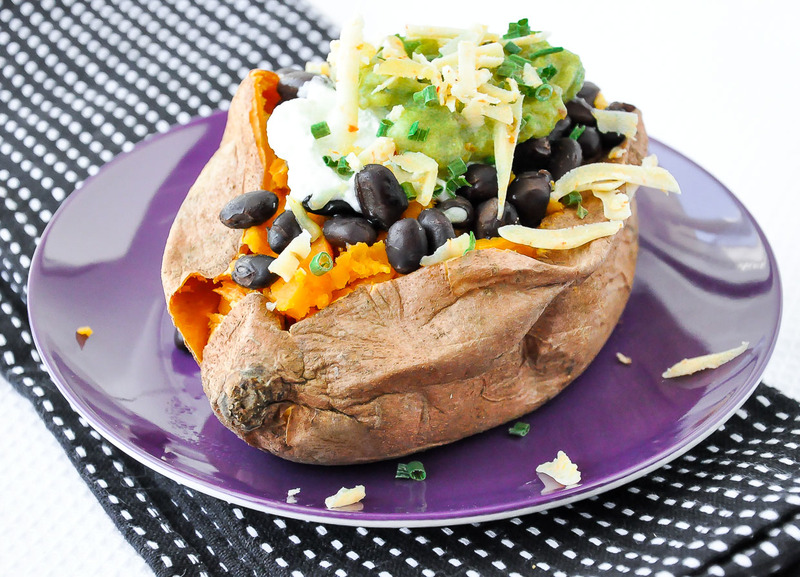 I have a recipe for twice-baked sweet potatoes that I’ve been wanting to try. Looove roasted sweet potatoes with horseradish sauce or tzatziki! Have you ever put nut butters on a sweet potato? BEST thing ever! I have always loved sweet potatoes and I love all of the new and exciting ways to eat them. This looks amazing! Thanks Becky!!!! Grilled SP planks sounds soooooo good!!! I’ll have to try that! YUM, that looks incredible! So delicious – what a healthy, fun dinner. You know, I honestly like a little butter and salt best! corn and greek yogurt! I have some sprouts in my fridge right now I am trying to use up, will have to try it on a potato! I LOVE sweet potatoes! I recently received an ‘eCookbook’ with various recipes made of Maple syrup (I actually adopted a Maple tree with Rouge maple..a cool site!!). One of the recipe was for sweet potatoes…made with Organic Maple Syrup! It gives an incredible sweet taste…I would eat these potatoes every day!! Thanks for sharing! My Hubby and I are in love with sweet potatoes, too. Besides the fact that they are have good carbs, they taste so good. We cut them in planks, and grill them, with all of that caramelized goodness. We’ll have to try the stuffed version, now. Sweet potatoes are one of my FAVE foods. Honestly, I love them plain or turned into fries. My favorite toppings would be black beans and cottage cheese. The cottage cheese turns a little gooey when it mixes with the hot sweet potato. YUM!! I never tire of sweet potatoes. Bring ’em on! I usually eat mine plain though. I know, I know, lame. haha love the dumbell comment 🙂 and thanks for this list, im still only liking them in french fry form, trying to broaden my horizons and all. I want to jump at the monitor and just eat this up! Yum! This looks pretty yum-tastic to me! “If you look at that list sideways it kindddaaa looks like a dumbbell” – you’re so hilarious but I actually thought that even before I read that sentence haha! Funny how our minds work. 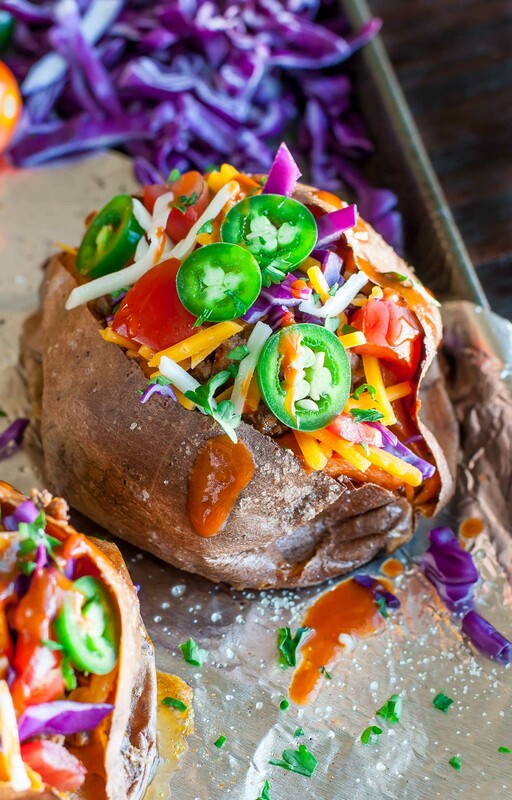 Thanks for the post, I love sweet potatoes – always have – but rarely eat them as a baked potato. Usually I mash them into things or have them in fries or cubes. I love this idea of things to top it with so I can start just eating them on their own! I actually bought a whole bag from the store this week just with that in mind. Thanks girl! I feel like I hate sweet potatoes too. I can’t remember the last time I had one but I do remember not liking them. Did you just like them all of a sudden? Maybe I should be adventurous and try them again? I want to eat that picture. Oh girl I am totally the same way! I used to despise the things and now I can’t get enough! It IS funny how things change. In middle school I was the girl who packed an entire lunchbox of nothing but Little Debbie snacks (not kidding). And now, I’m the one in my family who’s always finding ways to make recipes healthier! OMG That picture. I almost licked the computer screen. At work. You’re going to get me fired! Also, there is a restaurant sort of near me that makes sweet potato and black bean burritos. It is heavenly. I love adding sprouts to sandwiches, never thought about a baked sweet potato. Looks delish!! Twice now this week, I’ve used guacamole and salsa on my sweet potatoes … and guess where I got that idea?! 😉 That would be YOU, my friend! Thank you for the delicious idea!! I just sprinkle them plain/raw on top! They’re AMAZING on salads, in smoothies, and in PB+J sandwiches too! 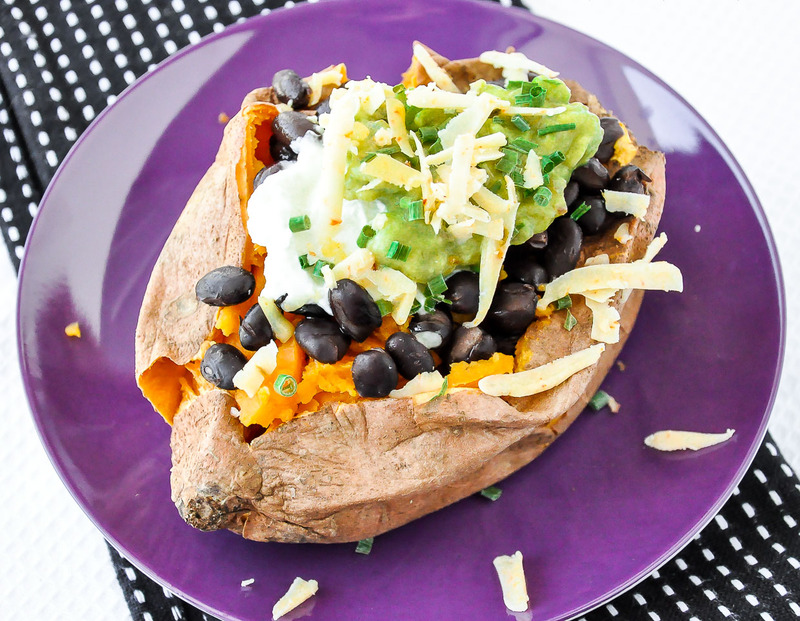 I love sweet potatoes and black beans, but never would’ve thought of putting them together. Can’t wait to try this combination! Maybe with some jalapenos? Great post – thank you for sharing! What do you do with Chia seeds before you put them on sweet potatos? I’ve only eaten them plain so far (they’re pretty delish on their own) but I definitely need to try out some of your ideas! it just keeps coming…such delish recipes ideas- the one with tortillas is the winner for me! yeeeessss. I share this intense love of sweet potaters. 🙂 I am LOVING topping mine with all different flavors of Laughing Cow Light. unreal! I used to be the same way! I hated sweet potatoes for a passion but about 2 years ago I fell in love and it has been the greatest thing ever. Give it to me any way… french fry form, chips, mashed, regular. yum yum yum! YUM! i LOVE sweet potatoes! my favorite things to slap on them are almond butter and greek yogurt.